Martyn Pick, digital artist, British animator and Director, is renowned for his distinctive fusion of live-action and animation, and the fluid, painterly style of his film-making. 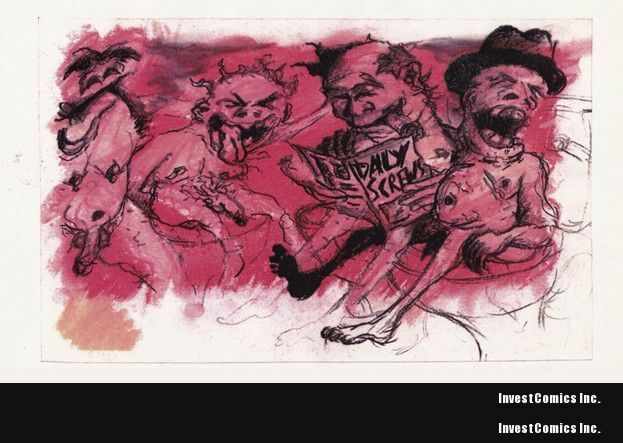 Martyn studied film and fine art at Central Saint Martins College of Art and Design and ever since then his work has been driven by the crossover of painting and cinema. His credits include animation director for the 2009 film THE AGE OF STUPID (a documentary that depicts a fictitious future archivist played by Pete Postlethwaite who looks at old footage to determine how mankind missed the obvious clues about global warming); LONDON 2012, the promotional film for the 2012 Olympics; the celebrated BBC promotional trailers for the Euro 2004 soccer tournament; and the Budweiser 2001 NBA commercials. But fanboys will be most impressed with Martyn’s first feature ULTRAMARINES − a slick 76-minute CGI, sci-fi thriller set in Game Workshop’s fictional Warhammer 40,000 universe and based on the ULTRAMARINES Chapter of SPACE MARINES (for more detail on Warhammer 40K, see Wikipedia here). 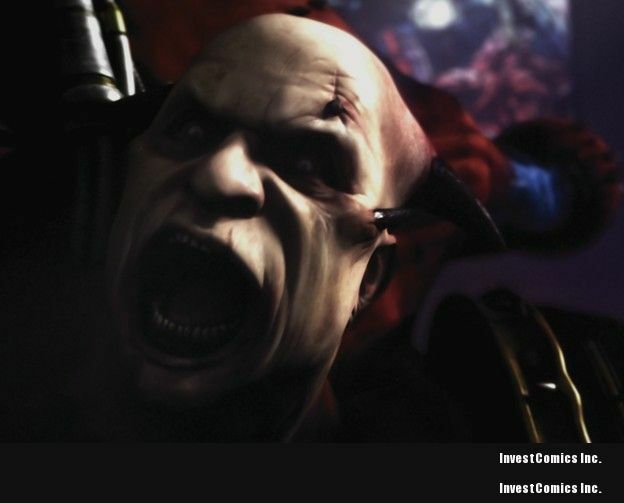 The 2010 film, which had a £6 million budget (or about $9 million USD), features Martyn’s trademark blend of animation and live action − creating a visceral, fast-paced film that is a faithful adaption sure to please avid 40K fans. You can get a blu-ray copy at Amazon here. Martyn − who is also a fine charcoal, portrait and sketch artist (see his whimsical hand-drawn work called THE FLEA CATCHER below) − recently took time to talk to me “across the Pond” and give me an update on his exciting projects. 1) The film logline for ULTRAMARINES sounds like a cross between ALIEN and STAR WARS (and that’s a good thing!) What was your reaction when you first read the script? (MARTYN:) It was a terse lean script that gave the audience a convincing first cinematic glimpse of the Warhammer universe. Given the immensity and detail of the Warhammer world, the script could have been overburdened with backstory and exposition. But by focusing on a small squad of warriors in hostile terrain, you had a tight contained story that held water and showed the dark grandeur of the world. There was the menace and drama of the squads’ quest which is further brought to life by the character conflict between the marines. And there are big epic and action scenes that build as the movie drives forwards. Screenwriter Dan Abnett’s dialogue had a powerful, warlike poetry as if it was from an authentic ancient text much like Homer or the Norse sagas. 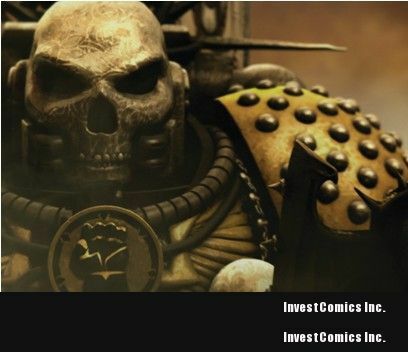 2) How did the Warhammer film end up in your virtual realm? Were you a fan of the game before the project came to you? (MARYN:) In my directing career I had created an intense dark style of mixed media that is far from the sweet quirky conventions of animation. Working in commercial animation companies there was always a tension! Nevertheless, I made a living while I continued to push this dynamic look in my short films. 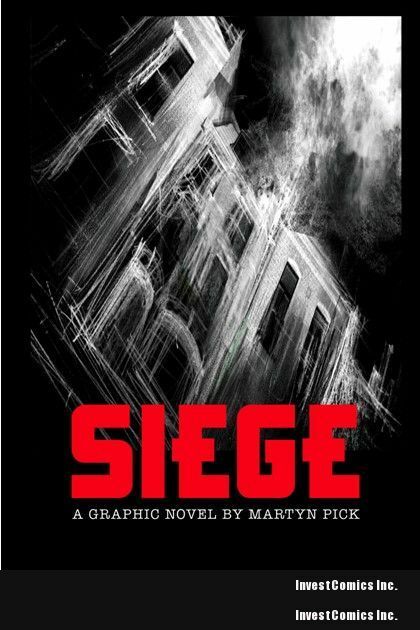 While directing commercials, I further evolved my work by producing a graphic novel SIEGE. Its atmospheric mix of photographic and hand-drawn artwork caught the eye of Bob Thompson, the producer who was developing ULTRAMARINES. It had common ground with the dark painterly look of Warhammer box art. With it, I could create an overall look that fused together the facial capture, CGI animation and matte paintings which would make the movie’s style. We worked together on a test that nailed this technique and secured the confidence of Games Workshop. I had seen the Games Workshop stores everywhere and knew of its huge loyal fan base and its dark imaginative mythology. There is an extreme passion for the world from the fans and for its visualization from the designers and artists. 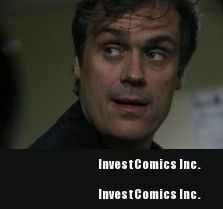 Only a limited quantity of the graphic novel were printed. You can buy SEIGE here. 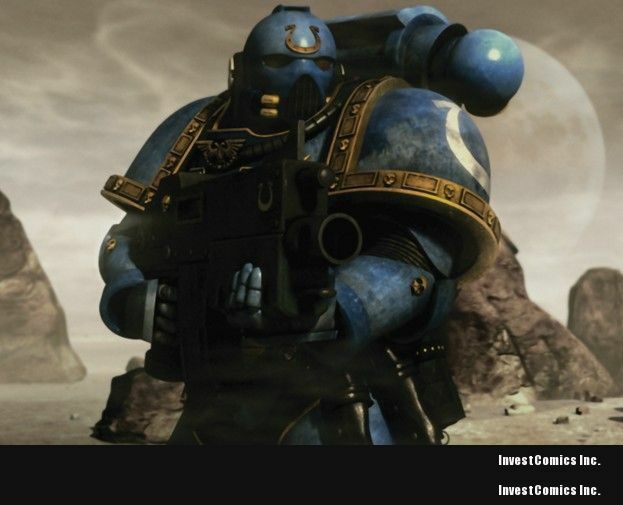 3) For ULTRAMARINES, you took on more roles than director − you also commandeered the visual design of the Ultramarines characters, Warhammer 40K universe, and adapted them to your talented cast. What goes into pre-production for an ambitious project like this? (MARTYN:) Intricate designs were produced for all the characters, uniforms, weapons, vehicles and environments. A lot of nailing the design was down to casting the right artists. Initially we went for concept artists who had worked closely already with Games Workshop as they were immersed in the universe. As we needed approval throughout from Games Workshop, this made the process more streamlined and freed us up to put more energy into other areas. I did a lot of concept art on the test which gave the film a cohesive look with strong key lighting, rich atmospheric weather and overall color casts. I then worked on a color palette that progressed throughout the film’s journey in sync with the developing mood. Coming from an art animation background, this is specifically something I brought to it. Pre-production included a drawn sketched storyboard cut to a quick table read of the dialogue. This enabled us to pre-visualize the film as a whole before committing to animation. The facial capture process required that we filmed the actors individually and just head and shoulders (happily for them, without any dots or markers on their faces). This was tough as they did not have the other actors to play off and hard for me because I could not see how a whole scene was playing out. Nevertheless we got great performances which were then pasted into the storyboarded edit so we could see how they gelled together. 4) Were you worried about alienating the Warhammer 40K fanbase? Tell us about the reaction so far. (MARTYN:) Sure, we had to think about the fans’ reaction as they were the core audience! We worked very closely throughout with Games Workshop checking the authenticity and tone of the world we were creating. Generally there has been a positive reaction. In late September at Games Workshops annual Games Day I spent 6 hours signing copies of the film non-stop for fans who love it as a very authentic focused introduction to the universe. It was a challenging production in that we had finite time and money (a decent budget for a first-time feature but tight for a CGI movie). Some have expected Hollywood blockbuster production values but our budget was a fraction of high-end games cinematics and movies like TRANSFORMERS ($150M budget) or LORD OF THE RINGS ($281M budget for the trilogy). Our budget was based on sales predicted globally to the fan base. Within that I know we pushed everything to the utmost and made a strong cohesive indie movie. 5) You have a great cast with Terence Stamp (THE LIMEY, STAR WARS: EPISODE 1), John Hurt (ALIEN, HELLBOY, V FOR VENDETTA) and Sean Pertwee (DOG SOLDIERS). What was it like directing them, and are any of them closet Warhammer gaming geeks? precisely, give simple clear motivation and then work the results. This is a subtle cinematic approach to acting rather than the broad gestures and signposting that animation suggests. My animation background really comes out more in atmosphere, kinetic action, spectacle, camera movement and graphic compositions. When approached for ULTRAMARINES, Terence Stamp asked around his circles and immediately found out about the extent of the fan base. John Hurt knew all about Warhammer because his son is a fan and had taken him to the Games Workshop store on London’s Oxford Street. And Sean Pertwee was already immersed in the culture of Games Workshop through his voiceover for the WARHAMMER 40,000: FIRE WARRIOR video game. Terence Stamp brought a real subtlety to his performance and John Hurt and Sean Pertwee brought an impeccable precise strength and range to their roles. Donald Sumpter (THE GIRL WITH THE DRAGON TATTOO) has a magnificently sour world-weary delivery. Steven Waddington (SLEEPY HOLLOW, LAST OF THE MOHICANS) brought an insubordinate tough arrogance to the role of Verenor. And Johnny Harris, who is very much up and coming (WAR HOURSE, ROCK ‘N ROLLA), has a real London method-acting intensity and extraordinary commitment. 6) What was the distribution strategy? I hear there is a Special Edition version of the film. Are there plans to make it available as a game and graphic novel? (MARTYN PICK:) The film is now available as Blu-ray, DVD and HD download. The special collector’s edition has a bonus content DVD (with making of featurettes) and a graphic novel covering the backstory to the film. It had preview screenings in the US and the UK earlier in the year and will have a theatrical run in London. At present it is a property that stands alone from the games that have been produced from the universe. 7) Where can we get the film? And are there plans for a sequel? (MARTYN PICK:) A direct way to get the film is from the ULTRAMARINES movie website. And yes, the intention was always that this film would be the first of a series. 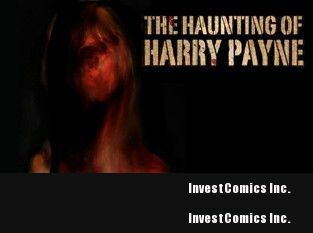 8) On to scarier topics, you recently completed post on a nifty little project called THE HAUNTING OF HARRY PAYNE about an elderly ex-gangster who has to deal with bad karma from beyond the grave. This was another ambitious script which you handled with a fast shoot and limited budget. What was most challenging about this film? (MARTYN:) The biggest immediate challenge for a tight budget and a four-week schedule was covering John Mangan’s complex narrative with its multiple locations. To achieve this, I sketched out the whole film as a rough board which helped focus and speed the shoot. And with the actors we had workshopped all the scenes to see what really played well and what needed pruning. Then while filming we improvised, condensing the script and finding alternate ways to tell the story visually. Andy Parsons, (the Director of Photography) and myself came up with a shooting strategy to give the film a unifying look: tight close-ups and wide shots with a lot of negative space. It worked very well. 9) What makes Harry Payne different from other films we’ve seen? And whom will it most appeal to? (MARTYN:) It has its own unique feel. Imagine a cult late 60’s/early 70’s British Horror but mixed with the surreal atmosphere of TWIN PEAKS. It should find an audience as a cult movie through its original mash up of the gangster and supernatural. 10) Where did you shoot it, what type of camera did you use, and how many days were you in principal photography? (MARTYN:) We shot across the atmospheric flatlands of England’s East Anglia in many locations: strip clubs, head shops, churchyards, forests and stately homes. We were constantly moving the unit across the counties of Norfolk and Suffolk. Particularly useful was an ex cold war US air force base where nuclear weapons used to be stored. It really was a stunning location with a network of bunkers and desolate woods. We shot on the Red camera package and the results really belied the budget with an elegant cinematic look. There were 24 long days in principal photography which was pretty fierce, but sometimes working at speed really gets your creative adrenalin going. 11) Tell us about the cast − several of them look familiar although we may not readily know their names. (MARTYN:) PH Moriarty was Hatchet Harry in Guy Ritchies LOCK, STOCK AND TWO SMOKING BARRELS. Graham Cole and Tony Scannell were both lead characters for many years in the UK police procedural series THE BILL. Katy Manning is well known for the character of Jo Grant in DR. WHO. These experienced actors brought great humanity and texture to their roles. In the other roles, we had Fliss Walton who is a fine stage actress and Anouska Mond who has been making a name for herself in UK genre cinema. 12) How will you release the film − limited theatrical distribution or straight to DVD and Pay-Per-View? (MARTYN:) The producers are going for limited theatrical release, then DVD and Pay-Per-View. Watch the trailer for the film on vimeo.com here. 13) Which do you enjoy more − working on larger animation projects or more intimate live action films? And what is your favorite genre? 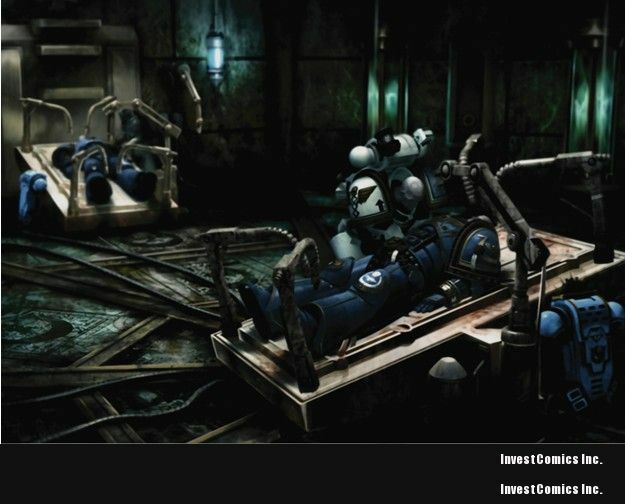 (MARTYN:) In terms of the facial capture and blocking out the shots, my direction of ULTRAMARINES was very much a subtle cinematic live-action approach rather than traditional animation. I like equally working on larger animation projects and smaller live-action films. The experience of the last few years has been refreshing working on the bigger canvas after doing commercials, promos and short films. It opens up your lungs! Making features is secretly what I signed up for. It’s what you wanted to do when you first saw movies as a kid. To name my favorite genre is hard to say but what I do like is when genre, be it horror, gangster or western, is done with an original twist and a personal perspective. 14) Who are you biggest influences from the artist perspective and from the director’s chair? Alfredson, Paul Verhoeven and Dario Argento. Particularly I am interested in directors who work personality and expressive filmmaking into genre material, straddling both the art house film and the traditional genre (i.e., horror, western, sci-fi) camps. In fine art, one strand I particularly like is the romantic sublime of the 19th century (Theodore Gericault, Eugene Delacroix, JMW Turner and John Martin) and how that later echoes in expressionistic and gestural painterly qualities in modern art and post-modern art (Jackson Pollock, Cy Twombly, Chaim Soutine, Mark Rothko. Anselm Kiefer,Peter Doig). 15) What are you working on next? Where we can follow your work and buy your films? 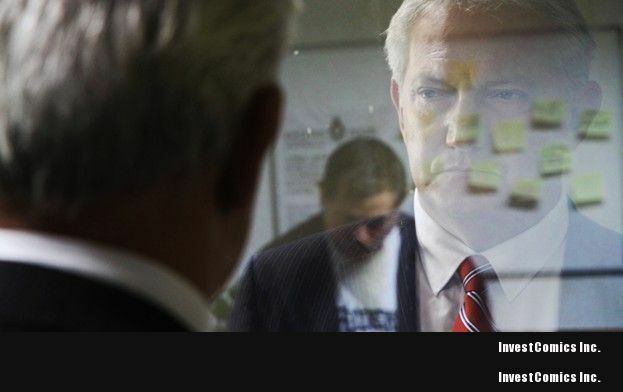 (MARTYN:) LONDON WASTE is a script that I am developing with a friend which is a brutal revenge thriller set in the current recession (it’s kind of UK TAXI DRIVER meets FALLING DOWN). I want to see my graphic novel SIEGE as a film. The apocalyptic mashup of animation and live-action in my short film PLAZA I also want to extend into a feature. There are some scripts I have been approached to direct and there is a classic property which would be a live-action/CGI/green screen horror feature. Strong tight stories that I can give cinematic scale and intensity. I am also currently working on an exhibition of my digital paintings to show an undiluted essence of my approach. A good place to get overview of my work is my website www.martynpick.com which has the links to my updates on twitter and my blog. 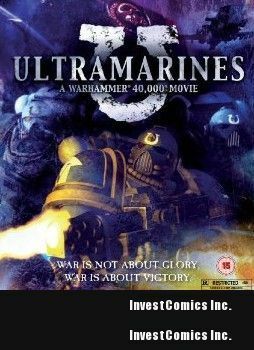 Here is a link to ULTRAMARINES official website: http://www.ultramarinesthemovie.com/. Thank you, Martyn, for a glimpse your impressive palette of work. We look forward to ULTRAMARINES and THE HAUNTING OF HARRY PAYNE. Cheers! I am a massive Warhammer fan and I try and get my hands on anything that is connected to it, really enjoyable read.